Seepu Seedai is a traditional chettinad special snack. I learnt this from one of our neighbours from Chettinad. They used to make this snack often at their home. Seepu in tamil means Comb. This seedai has comb like design on it and hence the name. 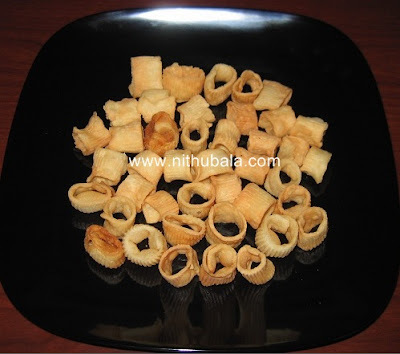 We can make this snack using a mould, called as seepu seedai kattai in Tamil. But, I used a comb (ofcourse a new one:-)) to make the design (I am yet to buy that kattai!). I can call it, a traditional method... This is a tedious process, still I enjoyed making it. 1. Mix water to coconut milk and dilute it. Keep aside. 2. Now, mix rice flour, roasted gram flour and salt together. 4. Mix the flour while adding the coconut milk. 6. Divide the dough in to small portions. Make them in to balls. 7. Now, in a oil greased plastic sheet, roll them like chappathi. 8. Take a comb, press gently, till a comb impression is seen. 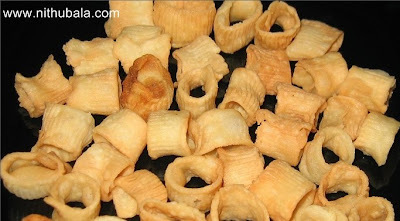 Cut that in to strip.Join the ends of each strip to form round ring like structure. 9. Repeat the process and once you make enough rings, heat oil. 11. Deep fry in oil. Drain excess oil on a kitchen tissue. 12. Store in air-tight containers for future use. Instead of roasted gram flour, urad dhal flour can be used. Else, you can also use both the flours in equal quantities. yummy.. luks delicious and crispy!!! These snacks look very crunchy and delicious.Must have the sweetness from the coconut milk. Wow, they look great, will surely give it a try. the cheedai looks crispy and cute. Wonderful snack, Nithu..Looks crispy and tasty..Loved the impressions on it..
Looks soo crunchy and yummy. delicious and yummy snack!! nice n crunchy seedai! looks yummmm! Wonderful snack, Nithu..Looks crispy and tasty. me too prepare this with slight varation in the ingredients,ur verion is simply superb.will try this method. Thanks for visiting my blog Nithu and your sweet comments! seepu seedai looks delicious. Wonderful snack, looks crispy and yummy. I still remember that my mom makes this often and i used to wear these seedais as rings and munch them..Beautiful seedais Nithu..makes me nostalgic. I like this seedail. I will try soon. Very new to me..Never heard of it..Looks delicious..Great one Nithu !! !